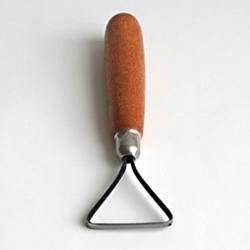 The ENPC4 Encaustic Loop Tool is a handmade tool with a straight edge loop made form high carbon steel. The edges (double-sided) are ground sharp for scraping. A well-balanced wood handle offers a good grip. Approximate length - 5 1/2" and approximate width of cutting edge is 1 1/2".